Geoffrey Castle and John Schussler Soaring, magical, solo electric 6-string violin. 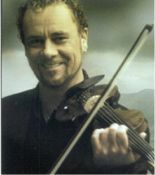 Geoffrey Castle is a pioneer on the six-string electric violin breaking the mold set by his European predecessors and rivaling for the title of the most influential violinist of this century. Castle raises the bar: bridging the gap between continents, transporting an ancient instrument to the forefront of popular opinion, and creating music that is beyond boundary, style and tradition. New World presents twelve original compositions by John Schussler and Geoffrey Castle, plus a stormy rendition of Ornette Coleman's "Lonely Woman" and a funky arrangement of several traditional Irish tunes in "Farewell to Inwood." Originally published as the Guarneri Undergound's first album, New World is now remastered to be clearer than ever, and features several tracks that have become audience and radio favorites. Click the button below to add the New World to your wish list.